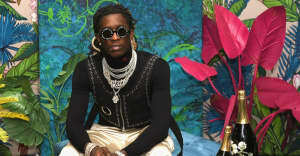 Young Thug has shared yet another snippet from the studio as he keeps the work going on his "singing album" Easy Breezy Beautiful Thugger Girls (E.B.B.T.G). This time Thugger improvises a beat while the appropriately named Wheezy Beats snores loudly. It's high thread count, down-stuffed fire. And, since Migos can turn their studio jingles into an actual licensing deal, what's stopping Thug from reaching out to Tempur-Pedic? Thumbnail photo by Kendrick Brinson for The FADER.